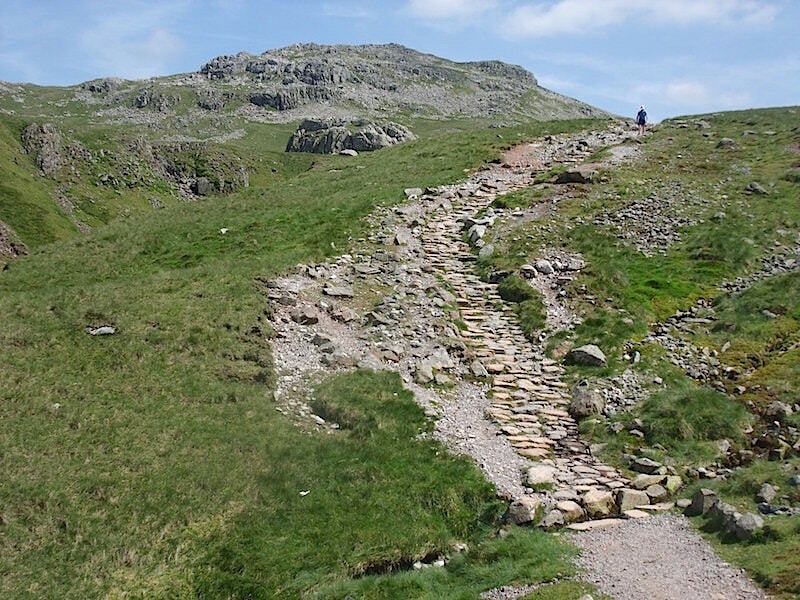 Walking up alongside Styhead Gill on a seriously hot morning with lots of water getting splashed on lots of faces as everyone walked along here. 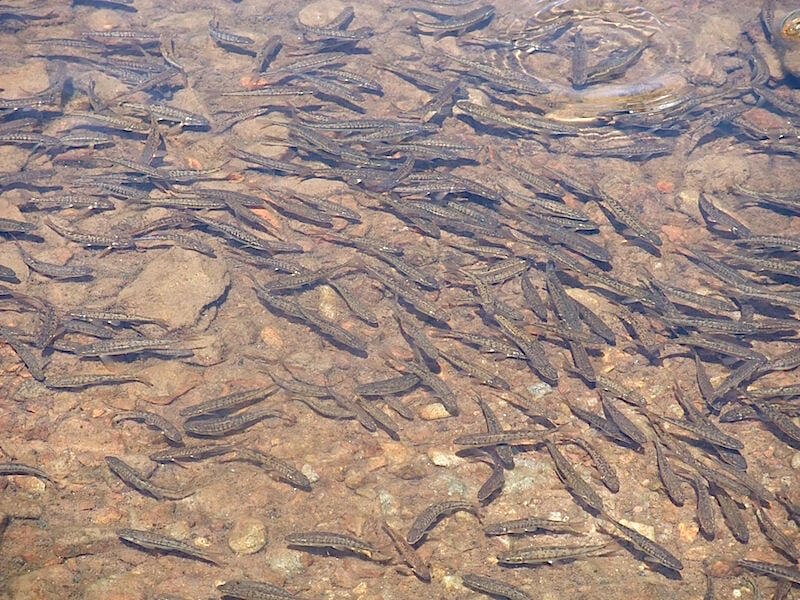 The clear, bubbling water made it very tempting to just sit and dangle your feet in it and forget about going any further. 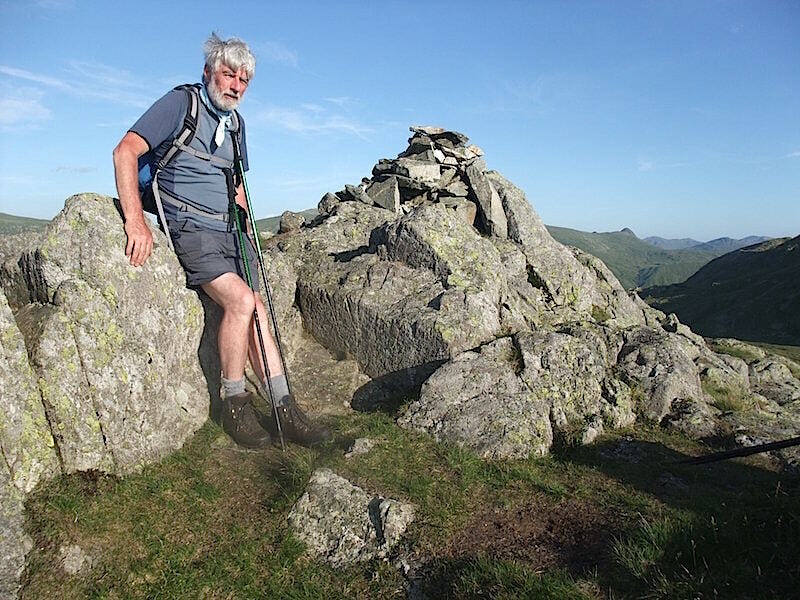 The gradient eventually levels out and further along the path Lingmell is directly in front of us. 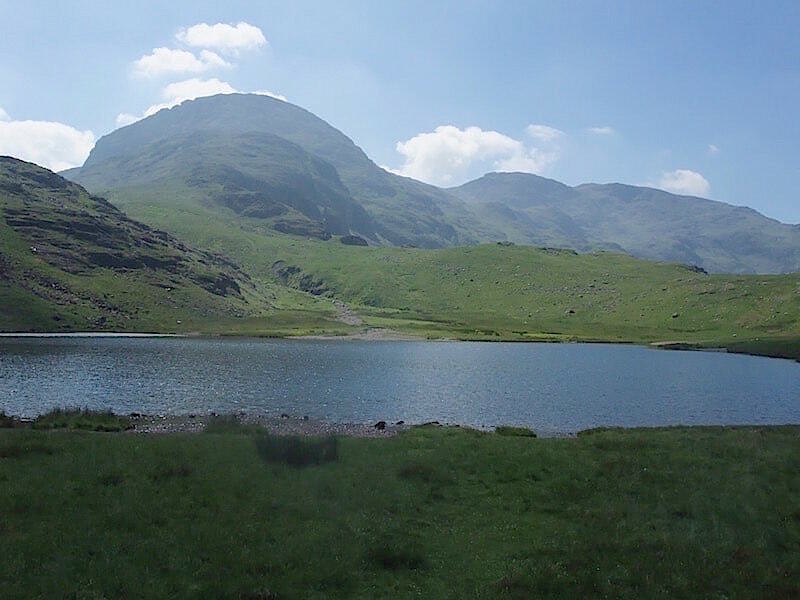 We reach Styhead Tarn and from it a view of Great End, the higher one on the left. A patch of cloud giving us some temporary relief from the hot sun. 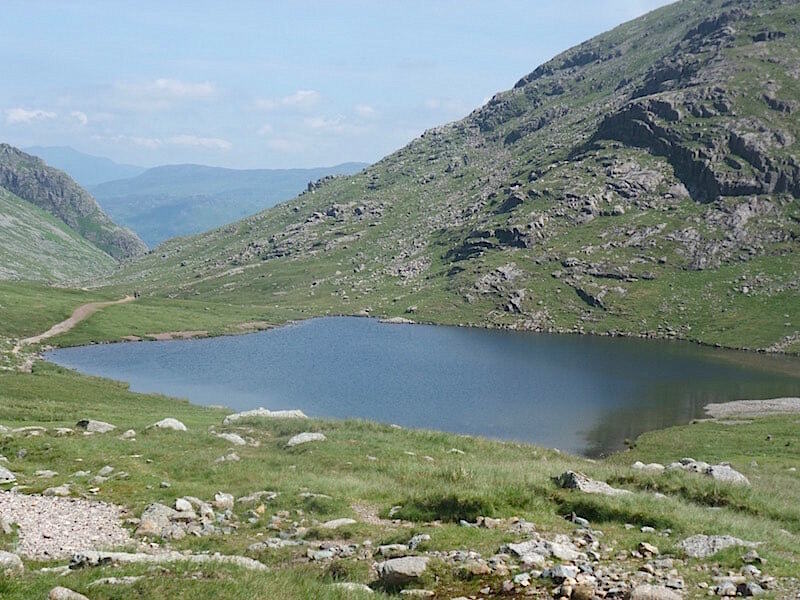 A look back at Styhead Tarn as we continue along the path. 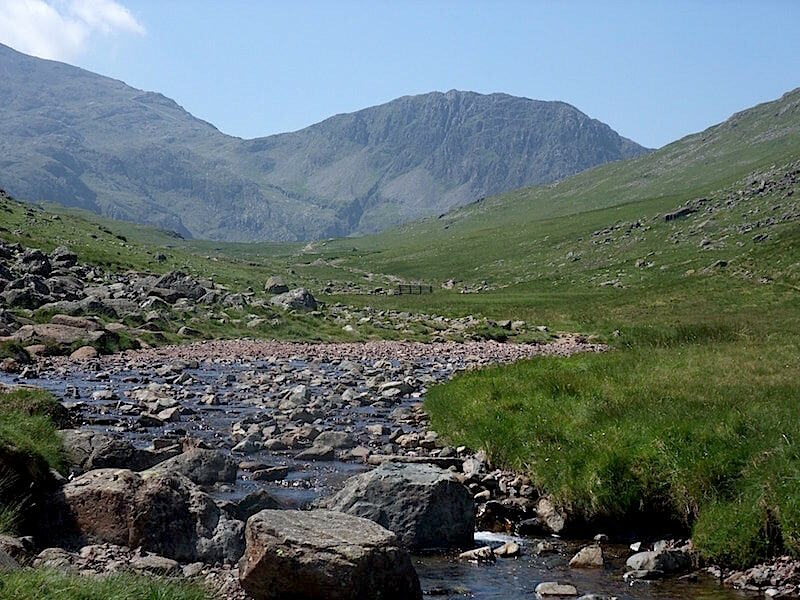 At Sty Head we branch off to the left and sweat our way up to Sprinkling Tarn where we get a skyline view of Great Gable, on the left, and Green Gable, on the right. 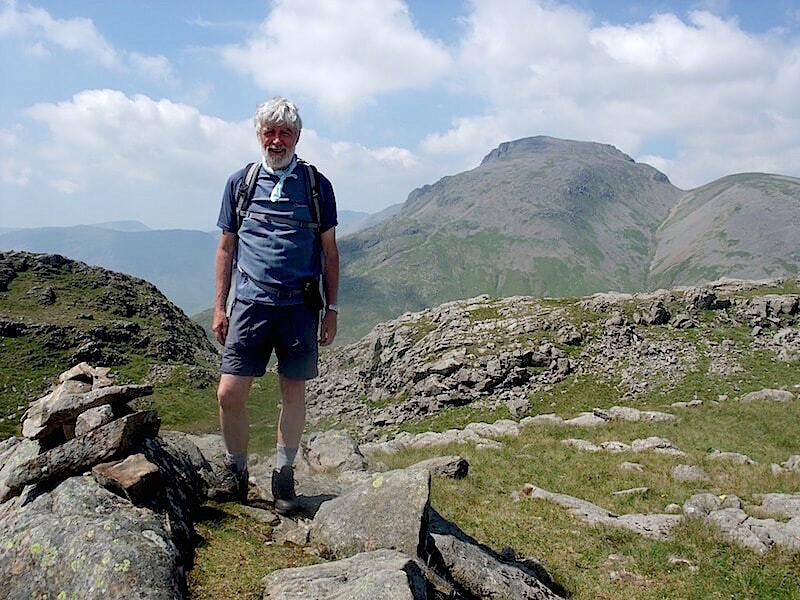 On Seathwaite Fell top with Great Gable and Green Gable in the background. 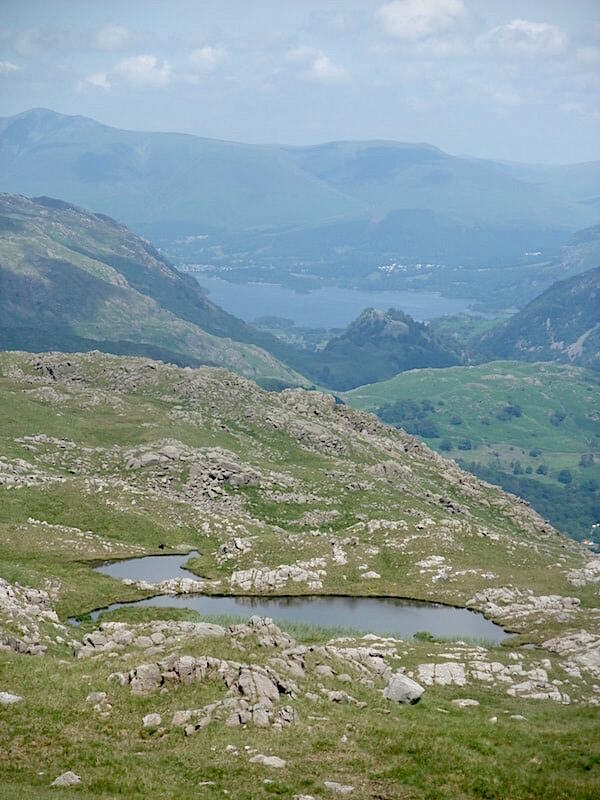 Looking down to Derwentwater beyond the tarns on Seathwaite Fell. 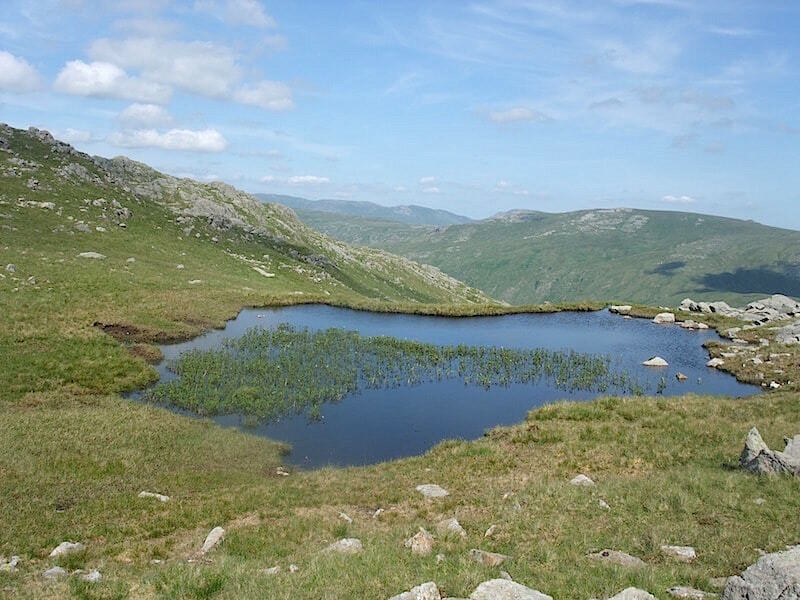 From the top of Seathwaite Fell we retrace our steps and pass by Sprinkling Tarn again, its so hot you could just leap straight into it …..
….. but you wouldn’t be the only swimmer in the tarn if you did. 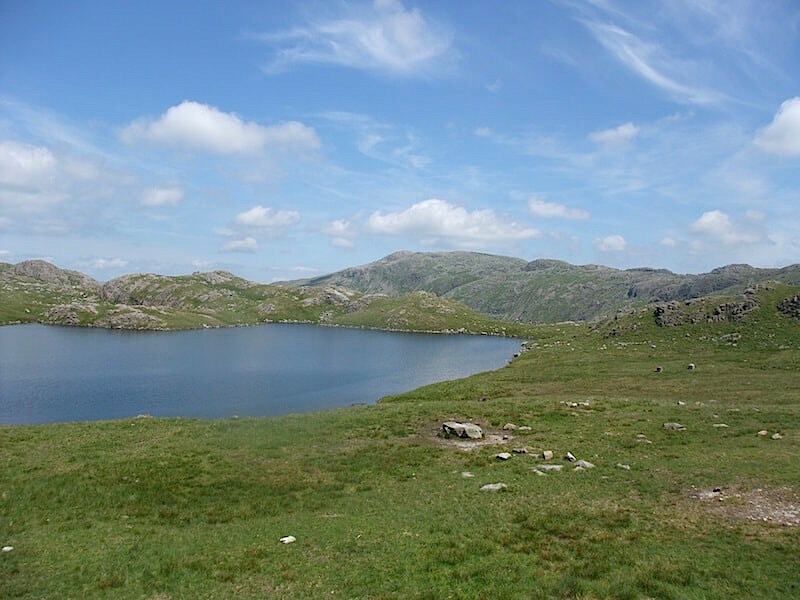 Looking across the tarn to the very long and undulating Glaramara ridge along which we will eventually be walking. 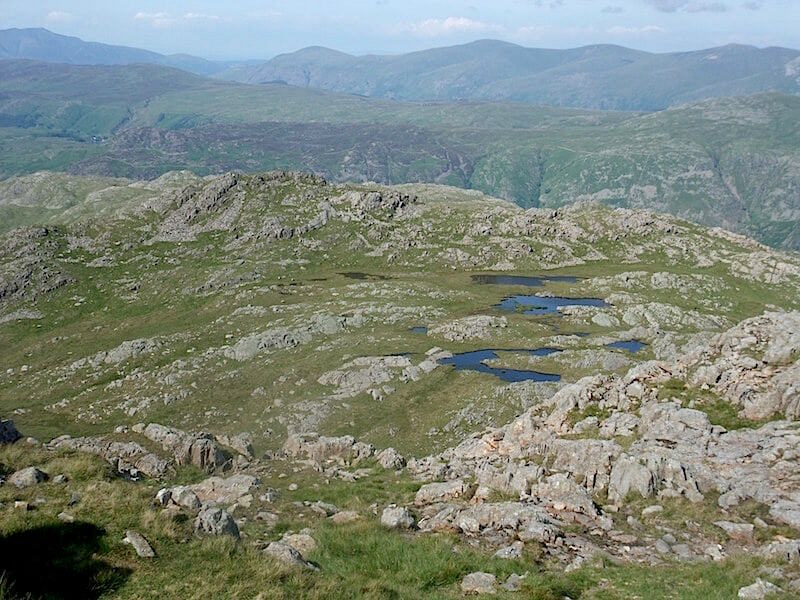 From Sprinkling Tarn we continue on and make our way towards Allen Crags, in the centre of the shot. 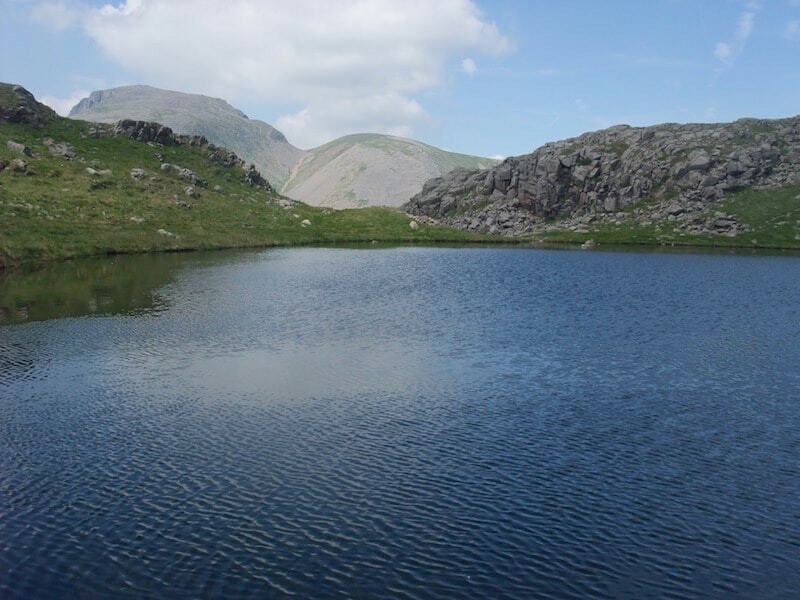 Great Gable across Sprinkling Tarn from Allen Crags. 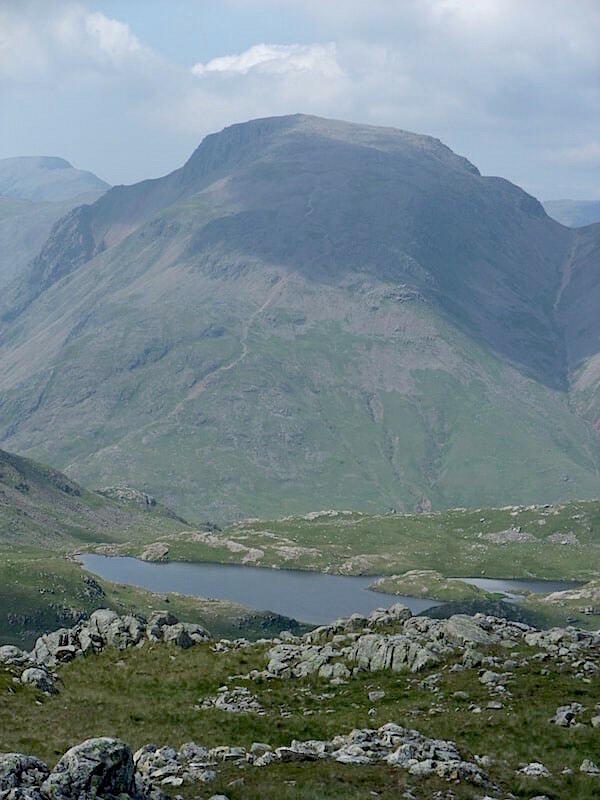 From this angle Great Gable always reminds me of the back view of an elephant, its flat head and big ears being in the shade and the rest of its back in the sun. 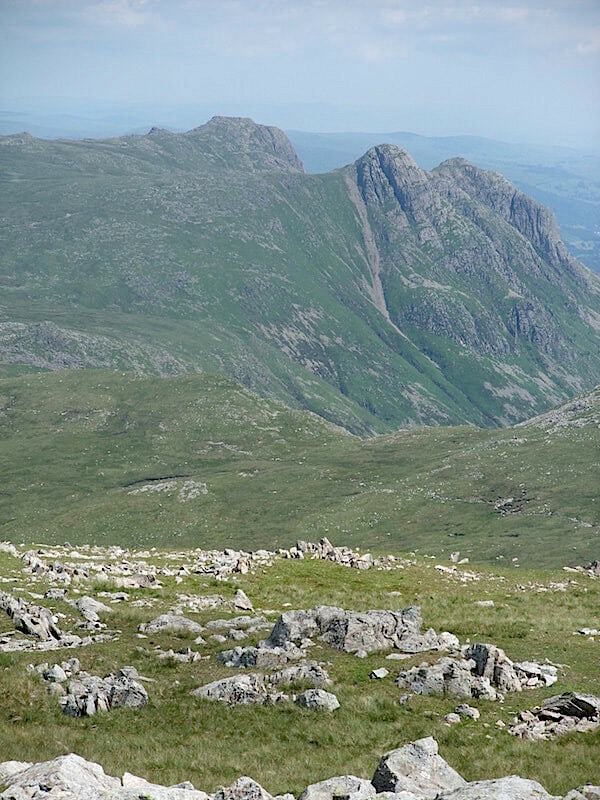 From left to right – Harrison Stickle, Pike O’Stickle and Loft Crag, collectively known as The Langdale Pikes. 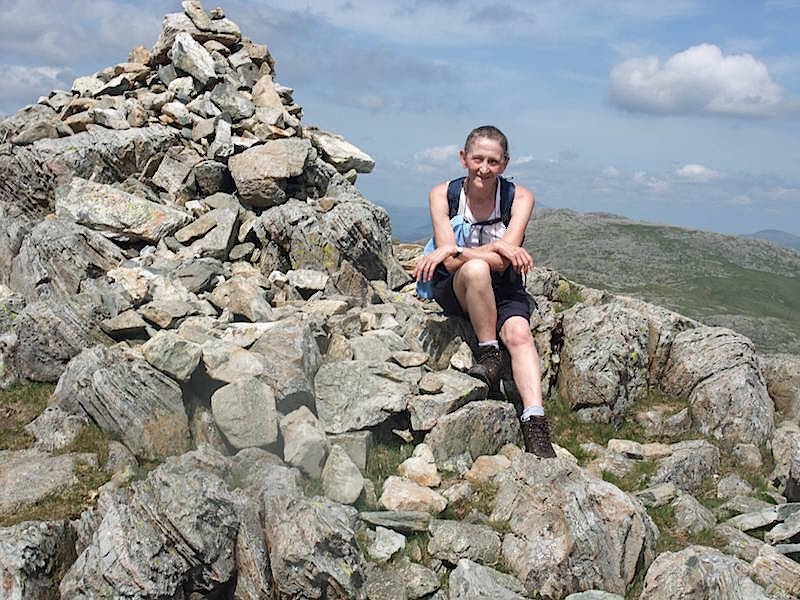 On Allen Crags summit, and yes, it was as hot as it looks, and we still have to walk across to Glaramara and then to Bessyboot, the summit of Rosthwaite Fell, in addition to the walk down and back along to the car, phew. 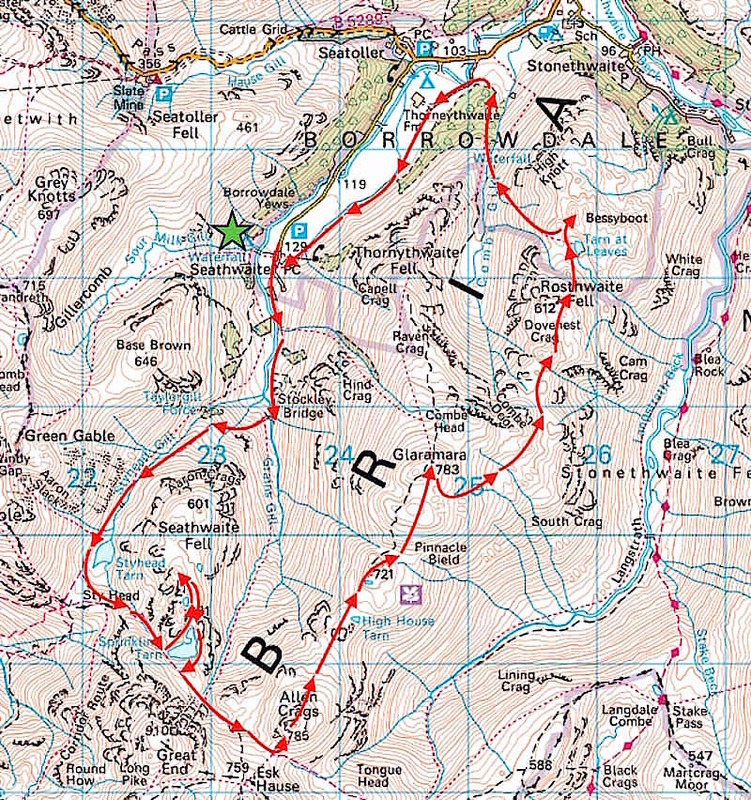 Off we go then, on the long up and down trek over to Glaramara. 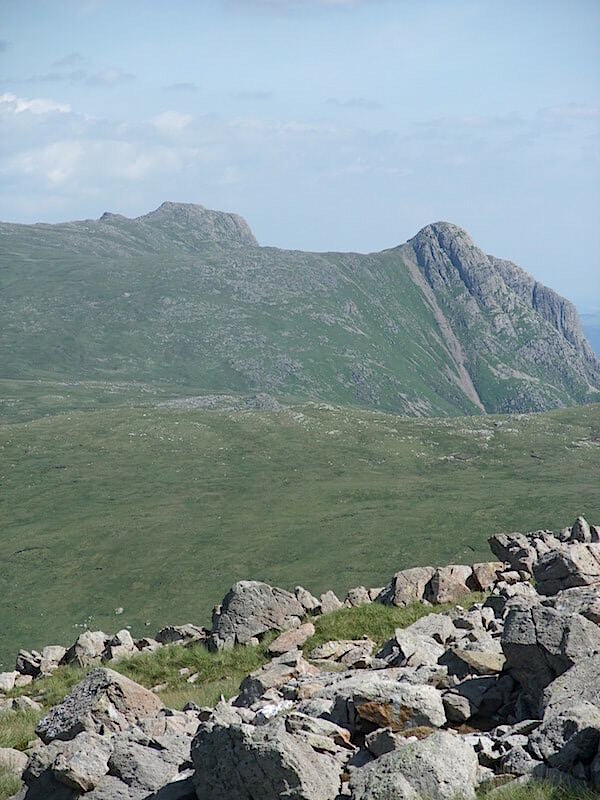 Just over the middle hump in the shot we met two walkers, an older man and his forty something son, both sweating heavily and looking very weary, who asked us, with some trepidation I think, how far away the Allen Crags summit was. 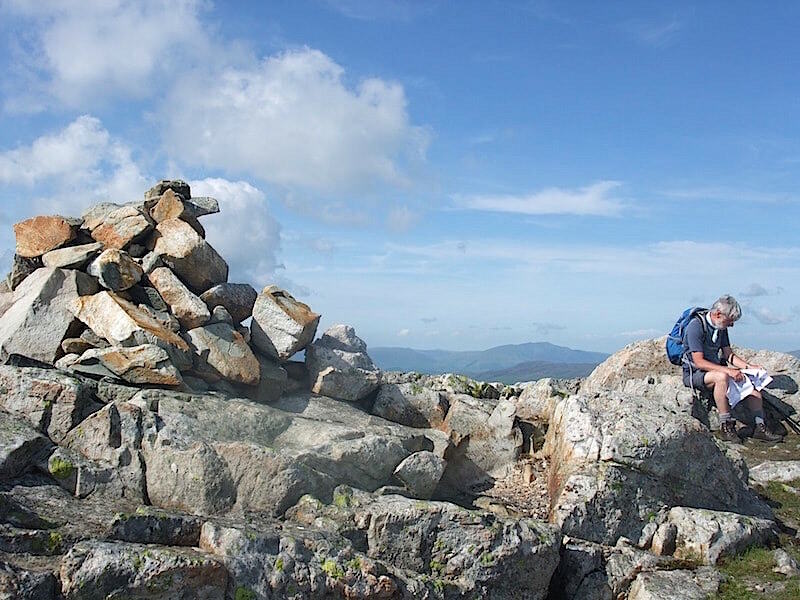 When we told them that they were very nearly there, the look of relief was remarkable, I think they had feared that it was still quite a distance away. 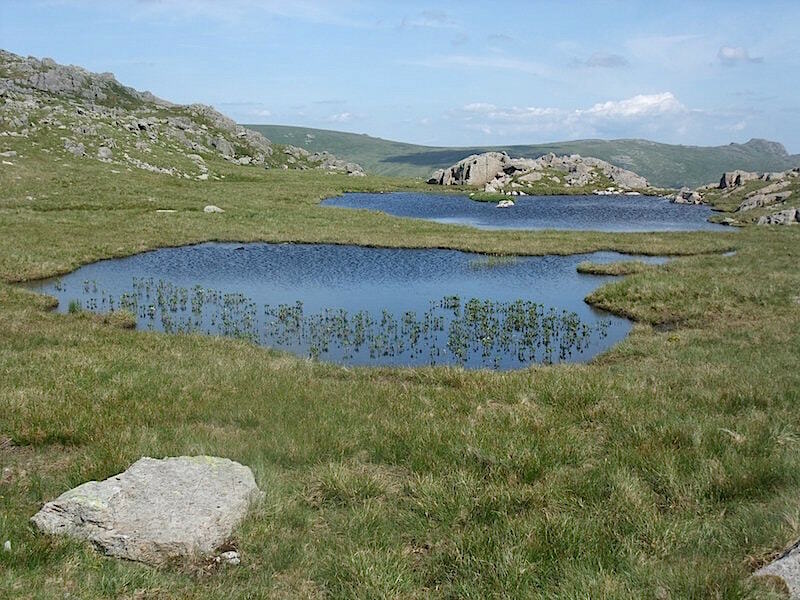 Scattered all the way along the route are many small, shallow tarns, not suitable as drinking water, but soaking a neck scarf in them and wrapping it around the neck was a wonderful coolant. The Langdale Pikes again as we cross over. 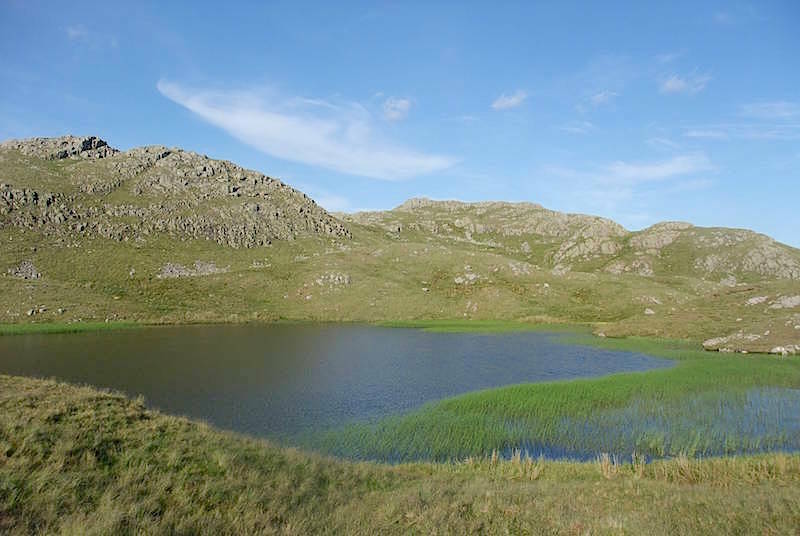 Lincomb Tarn, at the front, with High House Tarn behind it. 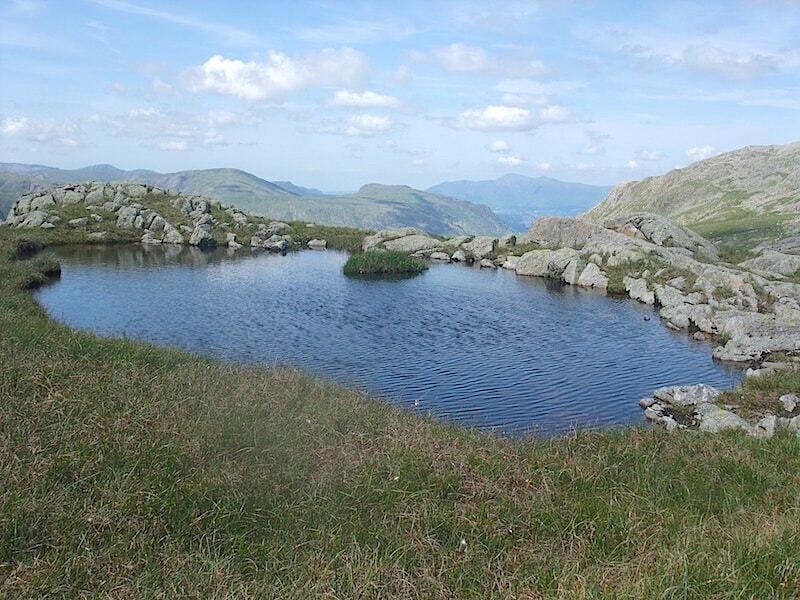 A very welcome sit down, and a route check, on Glaramara. 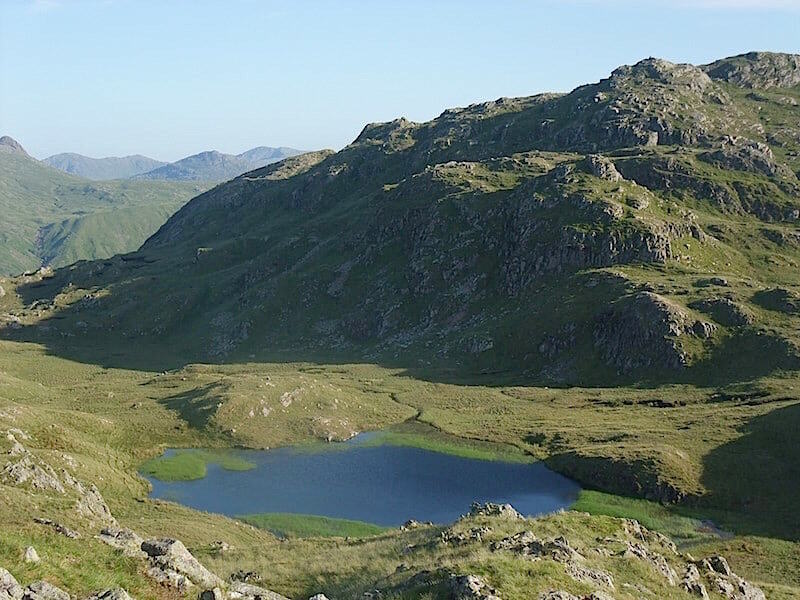 A view down to the Combe Head tarns from Glaramara. 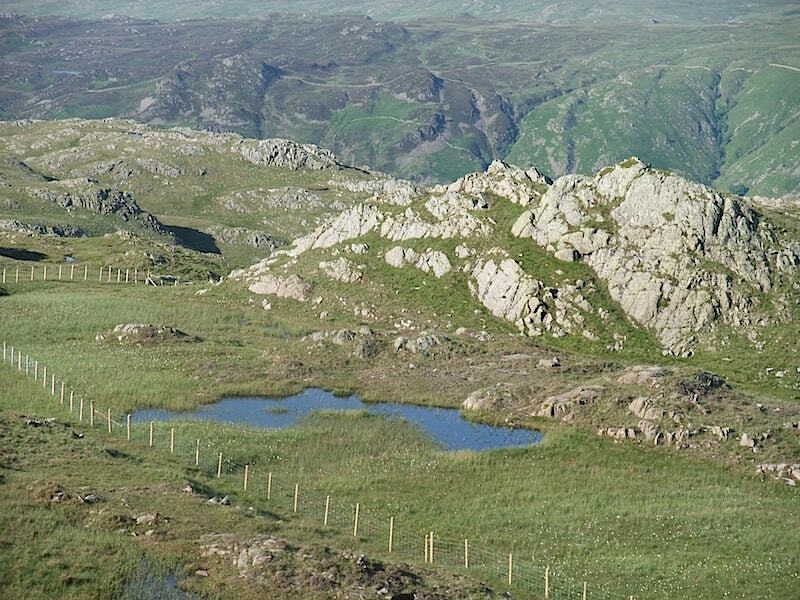 Another tarn over to the right as we make our way over to Rosthwaite Fell. 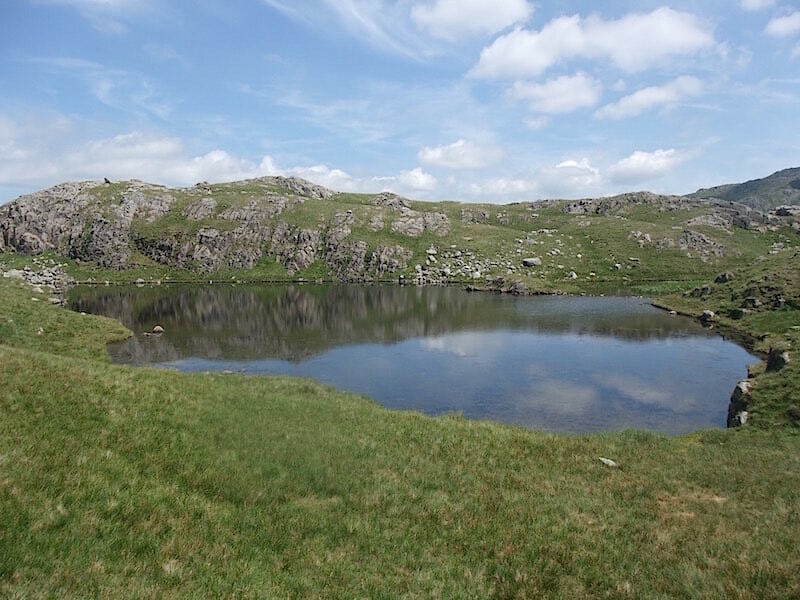 Finally, Tarn at Leaves comes into view, although its still a bit of way off. 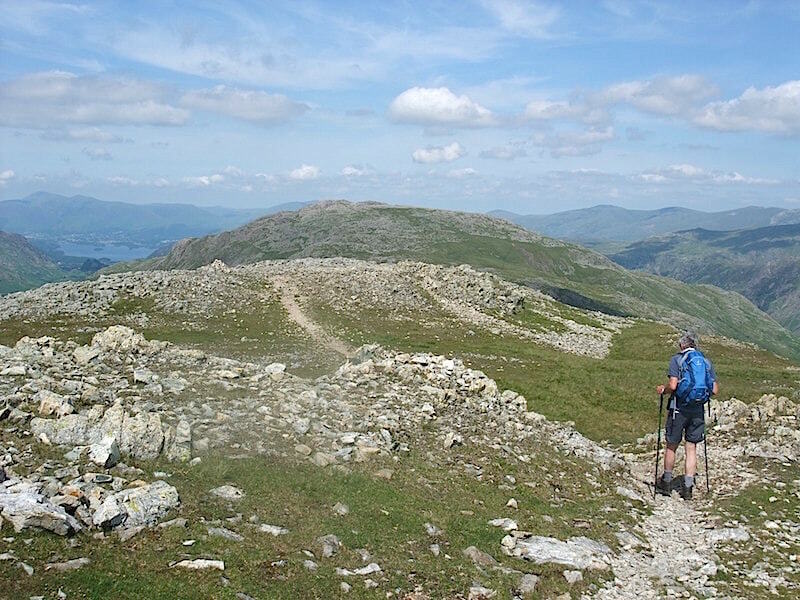 The knobbly hump over to the left is Bessyboot, the summit of Rosthwaite Fell. 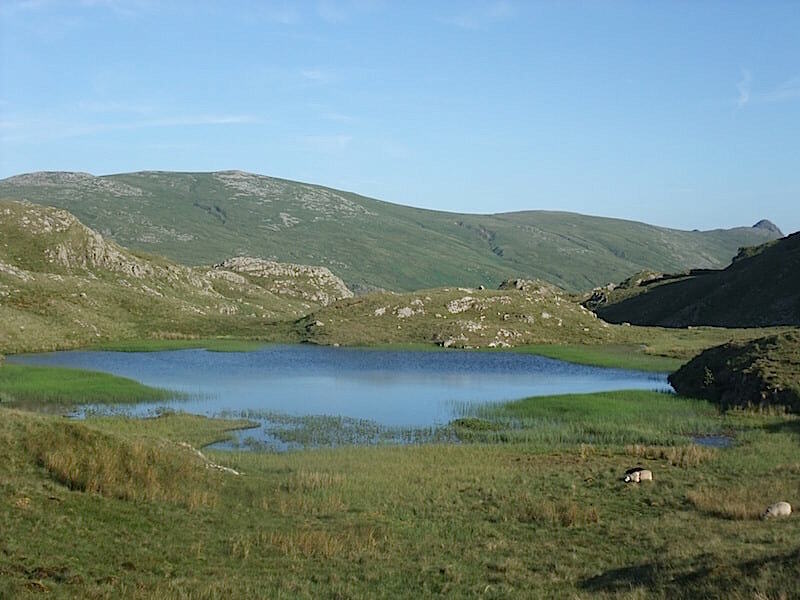 At long last we are down at the Tarn at Leaves. A curious name and I don’t know how it came about. 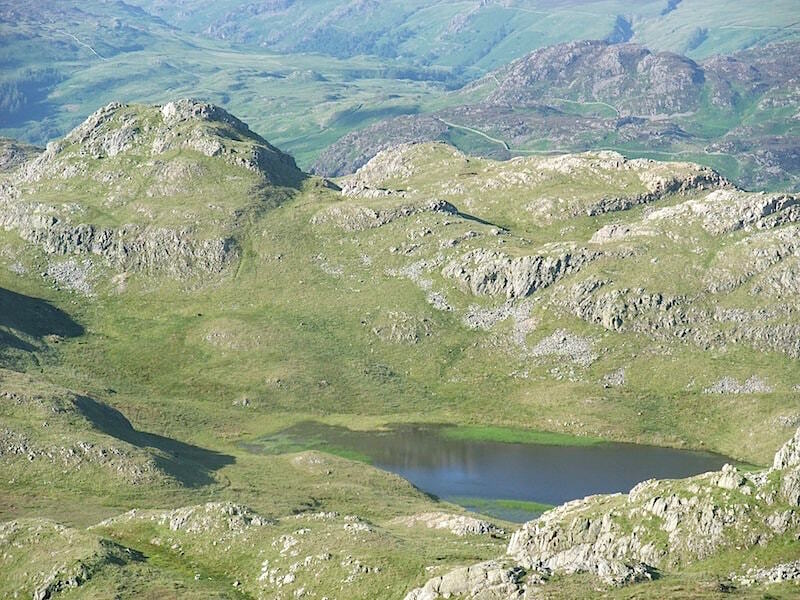 Finally, before we begin the descent, a view of Tarn at Leaves from Bessyboot summit. 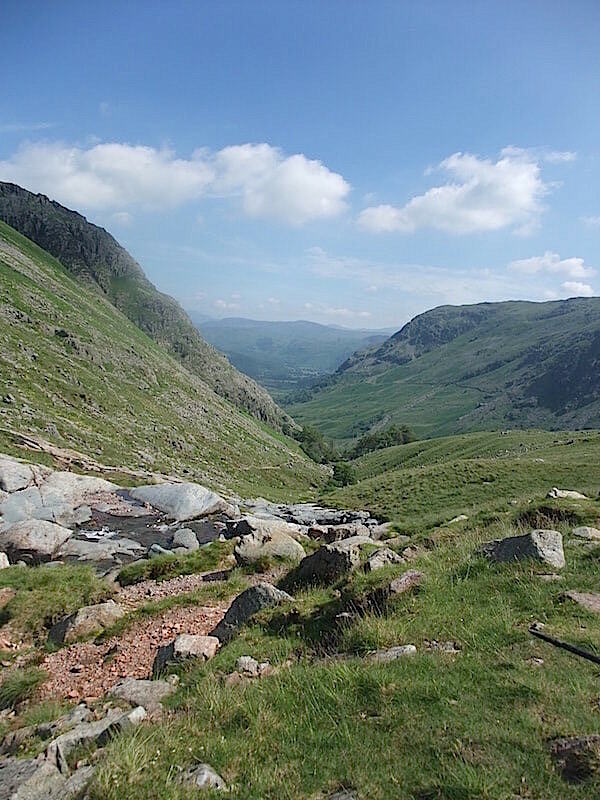 A long, very hot and tiring walk but a very enjoyable one despite all that.